about 8-9 minutes. Drain in a colander and reserve about 1 cup starchy pasta water. 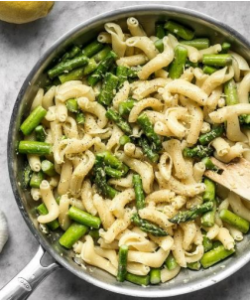 pasta to the asparagus plus ½ cup pasta water, season with salt and pepper and stir. pepper as needed. Serve pasta in bowls with fresh Parmesan on top.